I hope you are enjoying the weekend. I am finally catching up on sewing plans I have been delaying and I’m finally making some progress. For today’s edition of Tidbits I gathered some information about making an arm for your dressform. First I thought I would mention this nice blog I follow : Note to self. I just love the short note style and the pretty nordic style pictures! This post from Cloning Couture, is what reminded me about arm making. Mary is even offering her pattern for free! The last one, I’m terribly curious about. It’s from researcher Rickard Lindqvist who write all sorts of complicated interesting things about pattern making. His free pattern is a 3D simulation of an arm. It looks so unusual. If anyone you make it I hope you will let me know!! I have a total crush on the Fall 2017 RTW collection by Christian Dior. I just want to dress in subtle shades of navy all day, every day! Talking about Dior, here is an nice Instagram accountnice Instagram account of a “petite main” who works as an extra during runway season. Enjoy! That’s it for today, I hope you still find Tidbits interesting! Please let me know what you have been reading/watching/listening to! Exactly a year ago, I was sleeping all the time and outgrowing every single piece of clothing I owned. Morning sickness, elasticated pants, it was a bad baaad time… In addition, I just had sewn garments I really liked and couldn’t wear even once. The good news in this story, is that 1/ the most wonderful little human now lives with me and 2/ I can wear those clothes now! I’m going to play catch up and show you my early 2016 sewing. I drafted a lining for this version, which I keep hoping to also make available but time has been flying. Basically everything is ready but I should really proof it (ie. sew another skirt from it) before I spend time laying it out in Illustrator. If you are a risk taker, know how to bag a lining and want to help, email me! I’m very happy with this garment and I’ve been wearing it several time already since I went back to work. I’m afraid there is not that much to say about this skirt, except that trying to show the vent leads to pretty awkward poses… So let’s move on to the next item! This one is a bias silk tank top. It’s unlined and I finished the edges with a narrow bias binding (about 1/8″ finished width). It was my first time using a bias tape maker and I did a bad job. Hopefully no one will come close enough to notice… The fabric is a lovely silk that Eira from The Pattern Line bought for me at Moods when she came to Haiti for a sew-cation. Sewing friends are the best friends!! The pattern for this one is also my own, based it on my white slip dress. But if you are looking for a pattern to make something similar, we just released a bias tank top pattern through Just-Patterns. It features the same techniques (french seams, spaghetti straps and a baby hem). I know, I know, it’s one more shameless plug and I still haven’t taken the time to explain why this project is so important for me.I’m working on it, I promise! That’s it for today, next time I will be back with another slip dress which you may have already seen on Instagram. I’m still debating if I should post about the maternity sewing, I haven’t been very successful apart from the 2 shirts I posted last year, we will see. It looks like I’m back to blogging more regularly. Oops, did I just jinx it by writing that? But I’m actually enjoying it again. Let me know what you think in the comments!! It’s been a while since I wrote the last Tidbits, but here we are. I had drafts sitting in my blog editor forever and I had to delete a lot of the links which I thought were not relevant anymore. But I kept some, that I thought were interesting anyway. I want to mention first that if you are like me and enjoy those round-up posts, my two favorite sources articles you won’t find mentioned on all the other blogs are Oliver + S weekend links and the newsletter of Center for Pattern Design. I have an obsession about automated drafting to measurements so of course, Sew Fitography caught my eye. It seems to me that this is something that should already be widely available… At least, if I was a big pattern company, I would be investing on this quite a lot. Two years ago, I had an interesting discussion with the founder of Fitle (we graduated from the same business school) and it was fascinating. They are already working with established brands for RTW but also with custom shirt makers. The founder never thought about the home-sewing pattern market… Can you imagine trying on a pattern on your virtual double to decide what size to start with? All the fabric and time one would save?? That’s the dream for me! I just love when sewing intersects with new technology. I have so many questions about Kite, the pattern projector that Upcraft club is developing, but I’m excited to see what comes out!! This is a shameless plug, but my friend and I just started a pattern project. We had some sales already and we are super excited. I think you can tell that marketing is not our strong suit…. We’d rather be sewing all day!! I really want to do a full post here to explain the why and the what but I’m still thinking and pondering! I believe I could spend hours just looking at behind the scenes video of Couture…. I’ll assume that all of you saw Signé Chanel, but maybe you haven’t seen that short video on the making of the mirror dress from S/S 2017. A great article by Tim Gunn. That’s all for today! Did you read/see/heard something super interesting recently? Since I couldn’t sew for a while, and trying to avoid spending money as a way to cope (link), my only option is to talk, talk and talk about sewing. Unfortunately, neither my four-months old human or my 3-year old dog were very interested in the topic… You, readers, are my victims. Today, I will try to do round up of free patterns available in French, some are also translated into English. The big disclaimer is that I haven’t tried any, mostly because I don’t have the time but also because the French offer often does not match my aesthetic. However it doesn’t mean that there might not be something you like and it gives me something to do during nap time, so let’s jump in! Second and also very famous Pauline & Alice. I’m not even sure if this brand should be categorized as French… Free to download is the Bailen top & dress. Less known are the patterns released by the Vicomte de Boisjoly on her blog Essais&Erreurs. She has a great writing style, which shone during the whole Aime Comme Marie debacle and she makes available patterns of styles she drafts for herself. For the risk takers, here are the free patterns offered by Wear Lemonade. I talk about risks because most of the appeal seems to reside in its gorgeous and stylish owner but after quick look at the drafting, I saw some odd things. Proceed with caution! Patterns at Republique du Chiffon are probably a safer option, however reviewing pictures and my own experiment with Veste Francoise (which was 95% done when I left NY early December but you may not see until many months #lazyblogger), I’m not a fan of their sleeve/armscye draft. Make a muslin! Next up is this dress by I Am Patterns (sidenote: by now you must have noticed the tendency of using an English name for those companies, but I really can’t wrap my head around this one), available at Marie Claire Idées. For lingerie makers, you have a thong tutorial available at Je fais mes dessous (I make my undies). Lastly, the jeans from 1083 that I have mentioned before. If you want to make them, please note that there seam to be a mistake in the pattern, pointed out by YOU, dear readers. Have a look at the comments! So, what do you think? Did I miss any free French pattern? Did you make any successfully (or not)? Please share! Our life out of a suitcase in soon coming to an end after going to Haiti, France, back to Haiti and now emjoying Bogotá, Colombia. I can’t say that I haven’t missed home and I’m glad to be back in New York next week. Because as we all know, home is where sewing machines are!! When one itches to sew but cannot, there are usually two options available: shop ALL THE FABRIC or spend too much time thinking about what you could/will be sewing. I’m choosing the latter out of necessity, because i will not have any space to bring back fabric (crying face). Of course, announcing sewing plans for me is the equivalent of shooting myself in the foot and ensuring that none of those plans will ever come true. So bear with me, while I outline some imaginary sewing plans for 2017. 2016 has been very happy year for me, except in the wardrobe department. I did not particularly enjoy dressing my pregnant self and I’m glad to be able to think again in terms of what I want to wear rather than what I can. This year, I want to strengthen my work wardrobe so I have this idea that I could sew a mini capsule of 9 garments, one garment a month, starting from February. I think it sounds reasonable, but only time will tell! Let me introduce you to my #2017MakeNine! I’ve been meaning to sew a Stella Jean inspired skirt out of some African wax I have (bought back when I lived in Zambia). I would be such a quick project, I think this year will be the year!! 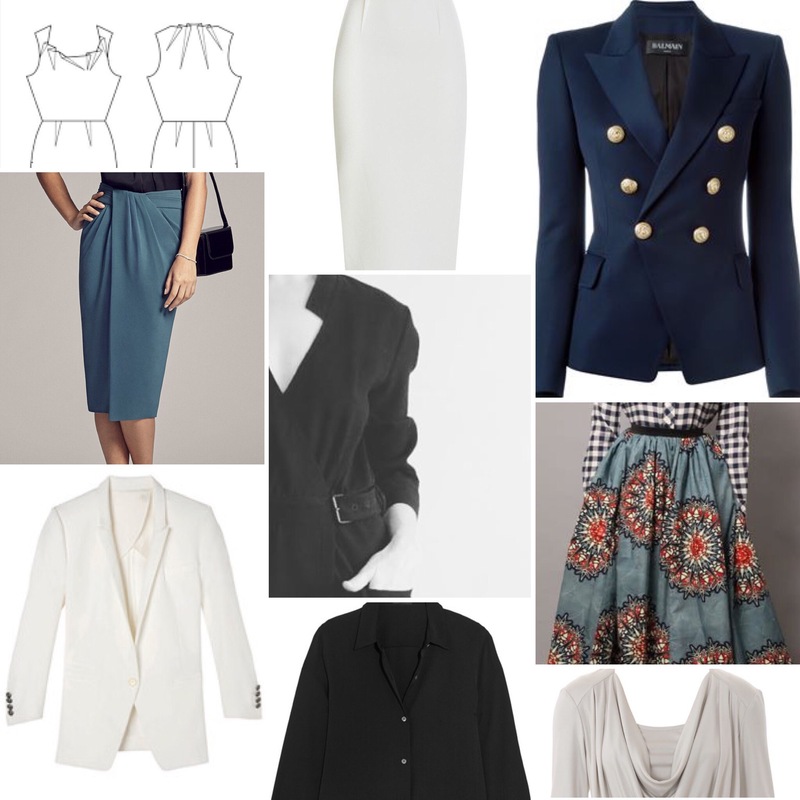 That’s pretty much how wild I’m ready to go for work, the other two I have in mind are a white pencil skirt (shown above is Roland Mouret) and one with some kind of wrap front (MM. LaFleur) for which I would probably have to wait to recover my dressform, currently waiting in Haiti for someone traveling to New York City (anyone??). I like the neckline of the Gimlet dress released by Capital Chic but it may not be realistic while I’m still breastfeeding, so I’ll see by next fall if I still like it. The other dress is also a personal pattern of The Pattern Line. I can’t show it to you entirely because we have grand plans for this dress, but in case you want an idea of what is coming, you can go there. I’ll write more in details about this project soon! This is where I’m not totally set, it will probably shirts/blouses but what kind and with what patterns remains to be defined. A black poplin shirt (shown here is Theory) would be useful, as well as a lighter silk blouse (here is a recent Burda cowl pattern). We will see, the shirtmaking bug seems to be itching again! Any recommendations are welcome! That’s it for today, let me know what you think and get ready for one of my blogging streaks where I blog 3 weeks in a row and then disappear for a while (hopefully not…)! !